Its Raw Power Blurs the Line Between Work and Play. The heart-pounding 30 horsepower liquid-cooled engine features two speeds - utility vehicle grind-away power and side-by-side flat-out fast. This four-valve technologically advanced engine from TGB - the number one engine for outdoor power sports equipment in Europe - makes it debut with Bad Boy Mowers and is superior to older technology two-valve engines by producing more torque and horsepower. Specifically designed for high performance, it’s a stable power plant that has been proven all over the world. Coupled with the only four-link rear suspension system in the industry (the same suspension used by rock-crawlers and off-road racing vehicles) it provides the traction of an independent suspension with the stability and pull capacity of a solid rear axle - with all four wheels gripping the ground. 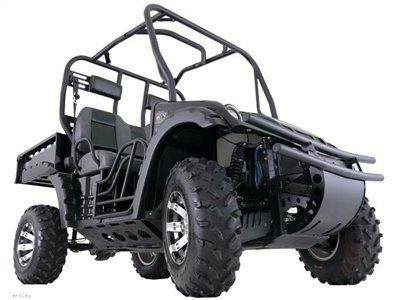 So go ahead and work it over or take it out for a romp in the woods - this side-by-side utility vehicle is ready for whatever world you work - or play in. 7.75 in. from lowest point of frameAt Frame: 10 in.